Make sure you thoroughly understand the following essential ideas which have been presented above. It is especially important that you know the precise meanings of all the bold terms in the context of this topic. Aside from their high molar masses, how do synthetic polymers differ from ordinary molecular solids? Polymers can be classified according to their chemical composition, their physical properties, and their general application. For each of these three categories, name two examples that that might be considered when adapting a polymer to a particular end-use. Explain the difference between a thermoplastic and a thermoset, and comment on the molecular basis for their different properties, including crystallinity. Describe the two general methods of polymer synthesis. Name two kinds each of commercially-important synthetic thermoplastics and thermosets, and specify some of their principal uses. Name two kinds of commercially-important natural polymers. Describe some of the concerns and sources of small-molecule release from polymers. What are some of the problems connected with recycling or re-use of polymeric materials? Plastics and natural materials such as rubber or cellulose are composed of very large molecules called polymers. Polymers are constructed from relatively small molecular fragments known as monomers that are joined together. Wool, cotton, silk, wood and leather are examples of natural polymers that have been known and used since ancient times. This group includes biopolymers such as proteins and carbohydrates that are constituents of all living organisms. Synthetic polymers, which includes the large group known as plastics, came into prominence in the early twentieth century. Chemists' ability to engineer them to yield a desired set of properties (strength, stiffness, density, heat resistance, electrical conductivity) has greatly expanded the many roles they play in the modern industrial economy. This Module deals mostly with synthetic polymers, but will include a synopsis of some of the more important natural polymers. 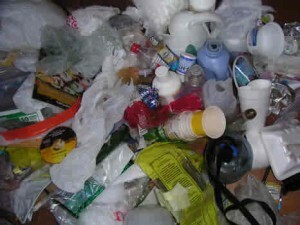 It will close with a summary of some of the very significant environmental problems created by the wide use of plastics. Let's begin by looking at an artificial polymer that is known to everyone in the form of flexible, transparent plastic bags: polyethylene. It is also the simplest polymer, consisting of random-length (but generally very long) chains made up of two-carbon units. You will notice some "fuzziness" in the way that the polyethylene structures are represented above. The squiggly lines at the ends of the long structure indicate that the same pattern extends indefinitely. The more compact notation on the right shows the minimal repeating unit enclosed in brackets overprinted with a dash; this means the same thing and is the preferred way of depicting polymer structures. In most areas of chemistry, a "pure substance" has a definite structure, molar mass, and properties. It turns out, however, that few polymeric substances are uniform in this way. This is especially the case with synthetic polymers, whose molecular weights cover a range of values, as may the sequence, orientation, and connectivity of the individual monomers. So most synthetic polymers are really mixtures rather than pure substances in the ordinary chemical sense of the term. Their molecular weights are typically distributed over a wide range. Don't be misled by chemical formulas that depict polymers such as polyethylene as reasonably straight chains of substituted carbon atoms. Free rotation around C—C bonds allows long polymer molecules to curl up and and tangle very much like spaghetti (Figure 7.11.2). Thus polymers generally form amorphous solids. There are, however, ways in which certain polymers can be partially oriented. Polymers can be classified in ways that reflect their chemical makeup, or perhaps more importantly, their properties and applications. Many of these factors are strongly interdependent, and most are discussed in much more detail in subsequent sections of this page. Thermal properties — can they soften or melt when heated? Physical properties such as hardness, strength, machineability. cross-linking - if polymer chains are linked together extensively by covalent bonds, the polymer is harder and more difficult to melt. The spaghetti-like entanglements of polymer molecules tend to produce amorphous solids, but it often happens that some parts can become sufficiently aligned to produce a region exhibiting crystal-like order, so it is not uncommon for some polymeric solids to consist of a random mixture of amorphous and crystalline regions. As might be expected, shorter and less-branched polymer chains can more easily organize themselves into ordered layers than have can long chains. Hydrogen-bonding between adjacent chains also helps, and is very important in fiber-forming polymers both synthetic (Nylon 6.6) and natural (cotton cellulose). Figure 7.11.3: The crystalline parts of this polymer are shown in blue. Pure crystalline solids have definite melting points, but polymers, if they melt at all, exhibit a more complex behavior. At low temperatures, the tangled polymer chains tend to behave as rigid glasses. For example, the natural polymer that we call rubber becomes hard and brittle when cooled to liquid nitrogen temperature. Many synthetic polymers remain in this state to well above room temperature. The melting of a crystalline compound corresponds to a sudden loss of long-range order; this is the fundamental reason that such solids exhibit definite melting points, and it is why there is no intermediate form between the liquid and the solid states. In amorphous solids there is no long-range order, so there is no melting point in the usual sense. Such solids simply become less and less viscous as the temperature is raised. In some polymers (known as thermoplastics) there is a fairly definite softening point that is observed when the thermal kinetic energy becomes high enough to allow internal rotation to occur within the bonds and to allow the individual molecules to slide independently of their neighbors, thus rendering them more flexible and deformable. This defines the glass transition temperature tg . Depending on the degree of crystallinity, there will be a higher temperature, the melting point tm , at which the crystalline regions come apart and the material becomes a viscous liquid. Such liquids can easily be injected into molds to manufacture objects of various shapes, or extruded into sheets or fibers. Other polymers (generally those that are highly cross-linked) do not melt at all; these are known as thermosets. If they are to be made into molded objects, the polymerization reaction must take place within the molds — a far more complicated process. About 20% of the commercially-produced polymers are thermosets; the remainder are thermoplastics. Copolymerization is an invaluable tool for "tuning" polymers so that they have the right combination of properties for an application. For example, homopolymeric polystyrene is a rigid and very brittle transparent thermoplastic with a glass transition temperature of 97°C. Copolymerizing it with acrylonitrile yields an alternating "SAN" copolymer in which tg is raised to 107°, making it useable for transparent drink containers. 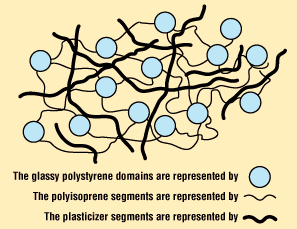 A polymer that is composed of identical monomeric units (as is polyethylene) is called a homopolymer. Heteropolymers are built up from more than one type of monomer. Artificial heteropolymers are more commonly known as copolymers. In a linear polymer such as polyethylene, rotations around carbon-carbon single bonds can allow the chains to bend or curl up in various ways, resulting in the spaghetti-like mixture of these different conformations we alluded to above. But if one of the hydrogen atoms is replaced by some other entity such as a methyl group, the relative orientations of the individual monomer units that make up a linear section of any carbon chain becomes an important characteristic of the polymer. Cis-trans isomerism occurs because rotation around carbon-carbon double bonds is not possible — unlike the case for single bonds. Any pair of unlike substituents attached to the two carbons is permanently locked into being on the same side (cis) or opposite sides (trans) of the double bond. If the carbon chain contains double bonds, then cis-trans isomerism becomes possible, giving rise to two different possible configurations (known as diastereomers) at each unit of the chain. This seemingly small variable can profoundly affect the nature of the polymer. For example, the latex in natural rubber is made mostly of cis-polyisoprene, whereas the trans isomer (known as gutta percha latex) has very different (and generally inferior) properties. The tetrahedral nature of carbon bonding has an important consequence that is not revealed by simple two-dimensional structural formulas: atoms attached to the carbon can be on one side or on the other, and these will not be geometrically equivalent if all four of the groups attached to a single carbon atom are different. Such carbons (and the groups attached to them) are said to be chiral, and can exist in two different three-dimensional forms known as enantiomers. For an individual carbon atom in a polymer chain, two of its attached groups will ordinarily be the chain segments on either side of the carbon. If the two remaining groups are different (say one hydrogen and the other methyl), then the above conditions are satisfied and this part of the chain can give rise to two enantiomeric forms. A chain that can be represented as (in which the orange and green circles represent different groups) will have multiple chiral centers, giving rise to a huge number of possible enantiomers. In practice, it is usually sufficient to classify chiral polymers into the following three classes of stereoregularity, usually referred to as tacticity. The tacticity of a polymer chain can have a major influence on its properties. Atactic polymers, for example, being more disordered, cannot crystallize. Polymers are made by joining small molecules into large ones. But most of these monomeric molecules are perfectly stable as they are, so chemists have devised two general methods to make them react with each other, building up the backbone chain as the reaction proceeds. This method (also known as step-growth) requires that the monomers possess two or more kinds of functional groups that are able to react with each other in such a way that parts of these groups combine to form a small molecule (often H2O) which is eliminated from the two pieces. The now-empty bonding positions on the two monomers can then join together . Note that the monomeric units that make up the polymer are not identical with the starting components. In order to make this happen, a chemically active molecule (called an initiator) is needed to start what is known as a chain reaction. The manufacture of polyethylene is a very common example of such a process. It employs a free-radical initiator that donates its unpaired electron to the monomer, making the latter highly reactive and able to form a bond with another monomer at this site. In theory, only a single chain-initiation process needs to take place, and the chain-propagation step then repeats itself indefinitely, but in practice multiple initiation steps are required, and eventually two radicals react (chain termination) to bring the polymerization to a halt. As with all polymerizations, chains having a range of molecular weights are produced, and this range can be altered by controlling the pressure and temperature of the process. Note: the left panels below show the polymer name and synonyms, structural formula, glass transition temperature, melting point/decomposition temperature, and (where applicable) the resin identification symbol used to facilitate recycling. Tg = 145°C, Tm = 225°C. This polymer was discovered independently in Germany and the U.S. in 1953. Lexan is exceptionally hard and strong; we see it most commonly in the form of compact disks. It was once widely used in water bottles, but concerns about leaching of unreacted monomer (bisphenol-A) has largely suppressed this market. Tg = 76°C, Tm = 250°C. Thin and very strong films of this material are made by drawing out the molten polymer in both directions, thus orienting the molecules into a highly crystalline state that becomes "locked-in" on cooling. Its many applications include food packaging (in foil-laminated drink containers and microwaveable frozen-food containers), overhead-projector film, weather balloons, and as aluminum-coated reflective material in spacecraft and other applications. Tg = 50°C, Tm = 255°C. Nylon has a fascinating history, both scientific and cultural. It was invented by DuPont chemist Wallace Carothers (1896-1937). The common form Nylon 6.6 has six carbon atoms in both parts of its chain; there are several other kinds. Notice that the two copolymer sub-units are held together by peptide bonds, the same kinds that join amino acids into proteins. Nylon 6.6 has good abrasion resistance and is self-lubricating, which makes it a good engineering material. It is also widely used as a fiber in carpeting, clothing, and tire cord. Tg = 85°C, Tm = 318°C. Used in the form of fibers in rugs, blankets, and clothing, especially cashmere-like sweaters. The fabric is very soft, but tends to "pill" — i.e., produce fuzz-like blobs. Owing to its low glass transition temperature, it requires careful treatment in cleaning and ironing. Tg = –78°C, Tm = 100°C. Control of polymerization by means of catalysts and additives has led to a large variety of materials based on polyethylene that exhibit differences in densities, degrees of chain branching and crystallinity, and cross-linking. Some major types are low-density (LDPE), linear low density (LLDPE), high-density (HDPE). LDPE was the first commercial form (1933) and is used mostly for ordinary "plastic bags", but also for food containers and in six-pack soda can rings. Its low density is due to long-chain branching that inhibits close packing. LLDPE has less branching; its greater toughness allows its use in those annoyingly-thin plastic bags often found in food markets. A "very low density" form (VLDPE) with extensive short-chain branching is now used for plastic stretch wrap (replacing the original component of Saran Wrap) and in flexible tubing. HDPE has mostly straight chains and is therefore stronger. It is widely used in milk jugs and similar containers, garbage containers, and as an "engineering plastic" for machine parts. Tg = 114°C, Tm = 130-140°C. This clear, colorless polymer is widely used in place of glass, where its greater impact resistance, lighter weight, and machineability are advantages. It is normally copolymerized with other substances to improve its properties. Aircraft windows, plastic signs, and lighting panels are very common applications. Its compatibility with human tissues has led to various medical applications, such as replacement lenses for cataract patients. Tg = –10°C, Tm = 173°C. Polypropylene is used alone or as a copolymer, usually with with ethylene. These polymers have an exceptionally wide range of uses — rope, binder covers, plastic bottles, staple yarns, non-woven fabrics, electric kettles. When uncolored, it is translucent but not transparent. Its resistance to fatigue makes it useful for food containers and their lids, and flip-top lids on bottled products such as ketchup. Tg = 95°C, Tm = 240°C. Polystyrene is transparent but rather brittle, and yellows under uv light. Widely used for inexpensive packaging materials and "take-out trays", foam "packaging peanuts", CD cases, foam-walled drink cups, and other thin-walled and moldable parts. PVA is too soft and low-melting to be used by itself; it is commonly employed as a water-based emulsion in paints, wood glue and other adhesives. Tg = 85°C, Tm = 240°C. This is one of the world's most widely used polymers. By itself it is quite rigid and used in construction materials such as pipes, house siding, flooring. Addition of plasticizers make it soft and flexible for use in upholstery, electrical insulation, shower curtains and waterproof fabrics. There is some effort being made to phase out this polymer owing to environmental concerns (see below). Neoprene, invented in 1930, was the first mass-produced synthetic rubber. It is used for such things as roofing membranes and wet suits. SBS (styrene-butadiene-styrene) rubber is a block copolymer whose special durability makes it valued for tire treads. This highly-crystalline fluorocarbon is exceptionally inert to chemicals and solvents. Water and oils do not wet it, which accounts for its use in cooking ware and other anti-stick applications, including personal care products. These properties — non-adhesion to other materials, non-wetability, and very low coefficient of friction ("slipperyness") — have their origin in the highly electronegative nature of fluorine whose atoms partly shield the carbon chain. Fluorine's outer electrons are so strongly attracted to its nucleus that they are less available to participate in London (dispersion force) interactions. Kevlar is known for its ability to be spun into fibers that have five times the tensile strength of steel. It was first used in the 1970s to replace steel tire cords. Bullet-proof vests are one of it more colorful uses, but other applications include boat hulls, drum heads, sports equipment, and as a replacement for asbestos in brake pads. It is often combined with carbon or glass fibers in composite materials. The high tensile strength is due in part to the extensive hydrogen bonding between adjacent chains. Kevlar also has the distinction of having been invented by a woman chemist, Stephanie Kwolek. The thermoplastic materials described above are chains based on relatively simple monomeric units having varying degrees of polymerization, branching, bending, cross-linking and crystallinity, but with each molecular chain being a discrete unit. In thermosets, the concept of an individual molecular unit is largely lost; the material becomes more like a gigantic extended molecule of its own — hence the lack of anything like a glass transition temperature or a melting point. These properties have their origins in the nature of the monomers used to produce them. The most important feature is the presence of multiple reactive sites that are able to form what amount to cross-links at every center. The phenolic resins, typified by the reaction of phenol with formaldehyde, illustrate the multiplicity of linkages that can be built. These are made by condensing one or more types of phenols (hydroxy-substituted benzene rings) with formaldehyde, as illustrated above. This was the first commercialized synthetic molding plastic. It was developed in 1907-1909 by the Belgian chemist Leo Baekeland, hence the common name bakelite. The brown material (usually bulked up with wood powder) was valued for its electrical insulating properties (light fixtures, outlets and other wiring devices) as well as for consumer items prior to the mid-century. Since that time, more recently developed polymers have largely displaced these uses. Phenolics are still extensively used as adhesives in plywood manufacture, and for making paints and varnishes. Condensation of formaldehyde with urea yields lighter-colored and less expensive materials than phenolics. The major use if urea-formaldehyde resins is in bonding wood particles into particle board. Other uses are as baked-on enamel coatings for kitchen appliances and to coat cotton and rayon fibers to impart wrinkle- water-, and stain-resistance to the finished fabrics. Melamine, with even more amino (–NH2) groups than urea, reacts with formaldehyde to form colorless solids that are harder then urea resins. The are most widely encountered in dinner-ware (plastic plates, cups and serving bowls) and in plastic laminates such as Formica. 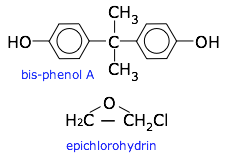 An ester is the product of the reaction of an organic acid with an alcohol, so polyesters result when multifunctional acids such as phthalic acid react with polyhydric alcohols such as glycerol. The term alkyd derives from the two words alcohol and acid. Alkyd resins were first made by Berzelius in 1847, and they were first commercialized as Glyptal (glycerine + phthalic acid) varnishes for the paint industry in 1902. The later development of other polyesters greatly expanded their uses into a wide variety of fibers and molded products, ranging from clothing fabrics and pillow fillings to glass-reinforced plastics. This large and industrially-important group of resins typically starts by condensing bisphenol-A with epichlorohydrin in the presence of a catalyst. (The -epiprefix refers to the epoxide group in which an oxygen atom that bridges two carbons.) These resins are usually combined with others to produce the desired properties. Epoxies are especially valued as glues and adhesives, as their setting does not depend on evaporation and the setting time can be varied over a wide range. In the two-part resins commonly sold for home use, the unpolymerized mixture and the hardener catalyst are packaged separately for mixing just prior to use. In some formulations the polymerization is initiated by heat ("heat curing"). Epoxy dental fillings are cured by irradiation with uv light. Organic isocyanates R–NCO react with multifunctional alcohols to form polymeric carbamates, commonly referred to as polyurethanes. Their major use is in plastic foams for thermal insulation and upholstery, but a very large number of other applications, including paints and varnishes and plastic wheels used in fork-lift trucks, shopping carts and skateboards. Polysiloxanes (–Si–O–Si-) are the most important of the small class inorganic polymers. The commercial silicone polymers usually contained attached organic side groups that aid to cross-linking. Silicones can be made in a wide variety of forms; those having lower molecular weights are liquids, while the more highly polymerized materials are rubbery solids. These polymers have a similarly wide variety of applications: lubricants, caulking materials and sealants, medical implants, non-stick cookware coatings, hair-conditioners and other personal-care products. Polymers derived from plants have been essential components of human existence for thousands of years. In this survey we will look at only those that have major industrial uses, so we will not be discussing the very important biopolymers proteins and nucleic acids. Polysaccharides are polymers of sugars; they play essential roles in energy storage, signaling, and as structural components in all living organisms. The only ones we will be concerned with here are those composed of glucose, the most important of the six-carbon hexoses. Glucose serves as the primary fuel of most organisms. Glucose, however, is highly soluble and cannot be easily stored, so organisms make polymeric forms of glucose to set aside as reserve storage, from which glucose molecules can be withdrawn as needed. In humans and higher animals, the reserve storage polymer is glycogen. It consists of roughly 60,000 glucose units in a highly branched configuration. Glycogen is made mostly in the liver under the influence of the hormone insulin which triggers a process in which digested glucose is polymerized and stored mostly in that organ. A few hours after a meal, the glucose content of the blood begins to fall, and glycogen begins to be broken down in order to maintain the body's required glucose level. In plants, these glucose-polymer reserves are known as starch. Starch granules are stored in seeds or tubers to provide glucose for the energy needs of newly-germinated plants, and in the twigs of deciduous plants to tide them over during the winter when photosynthesis (the process in which glucose is synthesized from CO2 and H2O) does not take place. The starches in food grains such as rice and wheat, and in tubers such as potatoes, are a major nutritional source for humans. Plant starches are mixtures of two principal forms, amylose and amylopectin. Amylose is a largely-unbranched polymer of 500 to 20,000 glucose molecules that curls up into a helical form that is stabilized by internal hydrogen bonding. Amylopectin is a much larger polymer having up to two million glucose residues arranged into branches of 20 to 30 units. Cellulose is the most abundant organic compound on the earth. Extensive hydrogen bonding between the chains causes native cellulose to be about 70% crystalline. It also raises the melting point (>280°C) to above its combustion temperature. The structures of starch and cellulose appear to be very similar; in the latter, every other glucose molecule is "upside-down". But the consequences of this are far-reaching; starch can dissolve in water and can be digested by higher animals including humans, whereas cellulose is insoluble and undigestible. Cellulose serves as the principal structural component of green plants and (along with lignin) in wood. Cotton is one of the purest forms of cellulose and has been cultivated since ancient times. Its ability to absorb water (which increases its strength) makes cotton fabrics especially useful for clothing in very warm climates. Cotton also serves (along with treated wood pulp) as the source the industrial production of cellulose-derived materials which were the first "plastic" materials of commercial importance. Nitrocellulose was developed in the latter part of the 19th Century. It is prepared by treating cotton with nitric acid, which reacts with the hydroxyl groups in the cellulose chain. It was first used to make molded objects the first material used for a photographic film base by Eastman Kodak. Its extreme flammability posed considerable danger in movie theaters, and its spontaneous slow decomposition over time had seriously degraded many early films before they were transferred to more stable media. Nitrocellulose was also used as an explosive and propellant, for which applications it is known as guncotton. Cellulose acetate was developed in the early 1900s and became the first artificial fiber that was woven into fabrics that became prized for their lustrous appearance and wearing comfort. Kodak developed it as a "safety film" base in the 1930's to replace nitrocellulose, but it did not come into wide use for this purpose until 1948. A few years later, is became the base material for magnetic recording tape. Viscose is the general term for "regenerated" forms of cellulose made from solutions of the polymer in certain strong solvents. When extruded into a thin film it becomes cellophane which has been used as a food wrapping since 1912 and is the base for transparent adhesive tapes such as Scotch Tape. Viscose solutions extruded through a spinneret produce fibers known as rayon. Rayon (right) was the first "artificial silk" and has been used for tire cord, apparel, and carpets. It was popular for womens' stockings before Nylon became available for this purpose. A variety of plants produce a sap consisting of a colloidal dispersion of cis-polyisoprene. This milky fluid is especially abundant in the rubber tree (Hevea), from which it drips when the bark is wounded. After collection, the latex is coagulated to obtain the solid rubber. Natural rubber is thermoplastic, with a glass transition temperature of –70°C. Raw natural rubber tends to be sticky when warm and brittle when cold, so it was little more than a novelty material when first introduced to Europe around 1770. It did not become generally useful until the mid-nineteenth century when Charles Goodyear found that heating it with sulfur — a process he called vulcanization — could greatly improve its properties. Why does a rubber band heat up when it is stretched, and why does it spontaneously snap back? It all has to do with entropy. 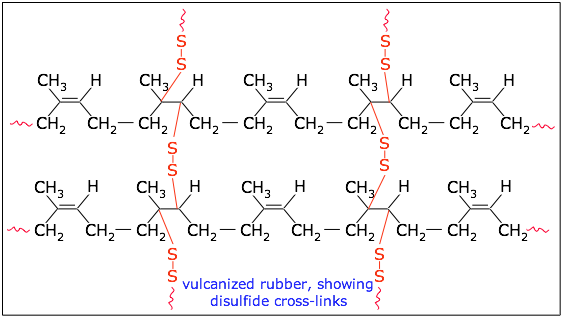 Vulcanization creates disulfide cross-links that prevent the polyisoprene chains from sliding over each other. The degree of cross-linking can be controlled to produce a rubber having the desired elasticity and hardness. More recently, other kinds of chemical treatment (such as epoxidation) have been developed to produce rubbers for special purposes. Many kinds of polymers contain small molecules — either unreacted monomers, or substances specifically added (plasticizers, uv absorbers, flame retardants, etc.) to modify their properties. Many of these smaller molecules are able to diffuse through the material and be released into any liquid or air in contact with the plastic — and eventually into the aquatic environment. Those that are used for building materials (in mobile homes, for example) can build up in closed environments and contribute to indoor air pollution. Formation of long polymer chains is a complicated and somewhat random process that is never perfectly stoichiometric. It is therefore not uncommon for some unreacted monomer to remain in the finished product. Some of these monomers, such as formaldehyde, styrene (from polystyrene, including polystyrene foam food take-out containers), vinyl chloride, and bisphenol-A (from polycarbonates) are known carcinogens. Although there is little evidence that the small quantities that diffuse into the air or leach out into fluids pose a quantifiable health risk, people are understandably reluctant to tolerate these exposures, and public policy is gradually beginning to regulate them. Perfluorooctanoic acid (PFOA), the monomer from which Teflon is made, has been the subject of a 2004 lawsuit against a DuPont factory that contaminated groundwater. Small amounts of PFOA have been detected in gaseous emissions from hot fluorocarbon products. These substances are compounded into certain types of plastics to render them more flexible by lowering the glass transition temperature. They accomplish this by taking up space between the polymer chains and acting as lubricants to enable the chains to more readily slip over each other. Many (but not all) are small enough to be diffusible and a potential source of health problems. Polyvinyl chloride polymers are one of the most widely-plasticized types, and the odors often associated with flexible vinyl materials such as garden hoses, waterbeds, cheap shower curtains, raincoats and upholstery are testament to their ability to migrate into the environment. The well-known "new car smell" is largely due to plasticizer release from upholstery and internal trim. There is now an active movement to develop non-diffusible and "green" plasticizers that do not present these dangers. Plastics-related compounds are not the only kind of endocrine disrupters found in the environment. Others include pesticide and fungicide residues, and industrial chemicals such as polychlorinated biphenols (PCBs). To complicate matters even further, many of these small molecules have been found to be physiologically active owing to their ability to mimic the action of hormones or other signaling molecules, probably by fitting into and binding with the specialized receptor sites present in many tissues. The evidence that many of these chemicals are able to act in this way at the cellular level is fairly clear, but there is still some dispute whether many of these pose actual health risks to adult humans at the relatively low concentrations in which they commonly occur in the environment. There is, however, some concern about the effects of these substances on non-adults and especially on fetuses, given that endocrines are intimately connected with sexual differentiation and neurological development which continues up through the late teens. Most commonly-used polymers are not readily biodegradable, particularly under the anaerobic conditions of most landfills. And what decomposition does occur will combine with rainwater to form leachates that can contaminate nearby streams and groundwater supplies. Partial photodecomposition, initiated by exposure to sunlight, is a more likely long-term fate for exposed plastics, resulting in tiny broken-up fragments. Many of these materials are less dense than seawater, and once they enter the oceans through coastal sewage outfalls or from marine vessel wastes, they tend to remain there indefinitely. Open burning of polymeric materials containing chlorine (polyvinyl chloride, for example) is known to release compounds such as dioxins that persist in the environment. Incineration under the right conditions can effectively eliminate this hazard. Disposed products containing fluorocarbons (Teflon-coated ware, some personal-care, waterproofing and anti-stick materials) break down into perfluorooctane sulfonate which has been shown to damage aquatic animals. There are two general types of hazards that polymers can introduce into the aquatic environment. One of these relates to the release of small molecules that act as hormone disrupters as described above. It is well established that small aquatic animals such as fish are being seriously affected by such substances in many rivers and estuarine systems, but details of the sources and identities of these molecules have not been identified. One confounding factor is the release of sewage water containing human birth-control drugs (which have a feminizing effect on sexual development) into many waterways. 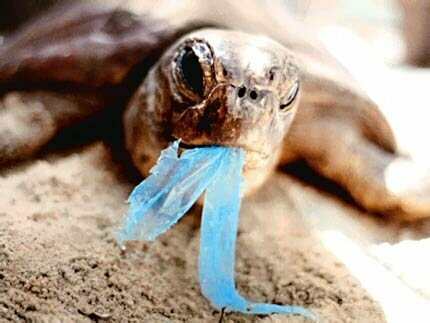 The other hazard relates to pieces of plastic waste that aquatic animals mistake for food or become entangled in. This plastic bag (probably mistaken for a jellyfish, the sea turtle's only food) cannot be regurgitated and leads to intestinal blockage and a slow death. These dangers occur throughout the ocean, but are greatly accentuated in regions known as gyres. These are regions of the ocean in which a combination of ocean currents drives permanent vortices that tend to collect and concentrate floating materials. 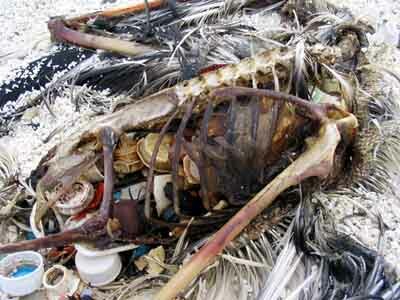 The most notorious of these are the Great Pacific Gyres that have accumulated astounding quantities of plastic waste. The huge quantity (one estimate is 108 metric tons per year) of plastic materials produced for consumer and industrial use has created a gigantic problem of what to do with plastic waste which is difficult to incinerate safely and which, being largely non-biodegradable, threatens to overwhelm the capacity of landfills. An additional consideration is that de novo production most of the major polymers consumes non-renewable hydrocarbon resources. Plastic water bottles (left) present a special recycling problem because of their widespread use in away-from-home locations. The energy-related costs of collecting and transporting plastic waste, and especially of processing it for re-use, are frequently the deciding factor in assessing the practicability of recycling. Collection of plastic wastes from diverse sources and locations and their transport to processing centers consumes energy and presents numerous operational problems. 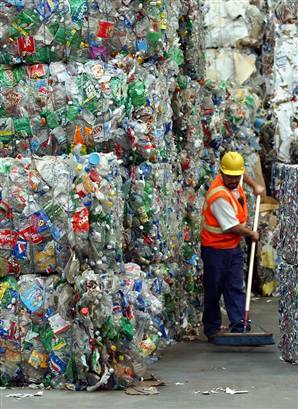 Most recycling processes are optimized for particular classes of polymers. The diversity of plastic types necessitates their separation into different waste streams — usually requiring manual (i.e., low-cost) labor. This in turn encourages shipment of these wastes to low-wage countries, thus reducing the availability of recycled materials in the countries in which the plastics originated. Thermal decomposition processes that can accommodate mixed kinds of plastics and render them into fuel oil, but the large inputs of energy they require have been a problem. A very small number of condensation polymers can be depolymerized so that the monomers can be recovered and re-used. Thermopolymers can be melted and pelletized, but those of widely differing types must be treated separately to avoid incompatability problems. Thermosets are usually shredded and used as filler material in recycled thermopolymers. In order to facilitate efficient recycling, a set of seven resin idenfication codes has been established (the seventh, not shown below, is "other"). These codes are stamped on the bottoms of many containers of widely-distributed products. Not all categories are accepted by all local recycling authorities, so residents need to be informed about which kinds should be placed in recycling containers and which should be combined with ordinary trash. The large number of rubber tires that are disposed of, together with the increasing reluctance of landfills to accept them, has stimulated considerable innovation in the re-use of this material, especially in the construction industry.